I could hear G wandering around, I didn’t open my eyes, I didn’t need to, I could follow his movements with my ears. Cupboard opening (jocks and socks) cupboard closed. Electric toothbrush on, tap running. Cupboard opening again (dental floss) cupboard closed. Cupboard opening, a suit came off the hanger, a shirt, a tie. Cupboard closed. A belt was fastened. I finally opened one eye to see him fully dressed with shoes in his hand. The third little traveler passed his father in the doorway. “Hey Mum” I wipe away the little tiny pieces of sleep dust in his eyes. “He’s gone to work, right?” He’s pretty sure I’m joking about the X Factor thing but he just wants to make sure. The remote is pointed towards the television, we are instantly joined by a bunch of leopards killing a small grey furry animal that neither of us can identify. It’s loud, too loud. He can’t get the buttons to work. The noise continues. I turn on my computer and read the news that I have not been chosen as a finalist for an Australian Blog competition. It confirms my suspicions that I should not be writing. I am clearly crap at it. Sudden movement catches my eye through the door frame, I see a silhouette, I know it will be the second little traveler. The other two, the two who share my morning disposition are fast asleep. I want to wallow in self pity, I wince at the idea of waking them, having the same conversation. “No way. Do I look like I have a death wish?” says the third traveler. I need smiles and optimism for this to work, I smile as I walk into the room. The first body is easily moved. “Can I carry you?” I offer. I take him into the next room and begin the next round of negotiations. We begin with a flat no and work from there. I remind her that it’s Thursday, that the week is nearly done and then I remember I have a wild card. There is testing today at school, it cannot be missed. A foot emerges from the quilt like a white flag in a battlefield. Downstairs, they all hover around me as I pour the smoothie and then gasp as the lid flies off of the top of the blender. 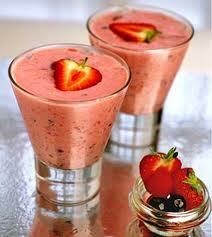 Thick strawberry smoothie juice flows over the kitchen bench and makes its way like lava over the kitchen cupboards. “What’d you do that for?” asks the fourth little traveler. I know that G has done this on purpose. It is clearly his fault and he has ruined my life. This smoothie is ruining my life. It is this smoothies fault that my book is unfinished and I have not been nominated for the bloggers competition. I hate this smoothie. This smoothie is making me feel worthless, useless, a complete failure. Two travelers begin a disagreement. One is reaching across the table with his hand saying “I bet you can’t hit me” and then cries when she proves him wrong. My teeth clench and my jaw aches while I mop up the smoothie, I shut out the sounds of “he asked me to” and “did too”. I open the refrigerator door. There is no cheese for sandwiches. The absent cheese is ruining my life. I hate the absent cheese. As glance towards the clock, I begin the routine. I wipe the last remnants of the smoothie from the cabinets. The smoothie that ruined my life is gone. It turns out that no-one wanted cheese in their lunch. Someone wants me to come to a concert this afternoon, and I think I can. I remember when I couldn’t go to the concert. When I was away. When I missed the rehearsal and a friend had to take photos for me. I’m not ready to go back there yet. And I’m freaking lucky I have the choice.